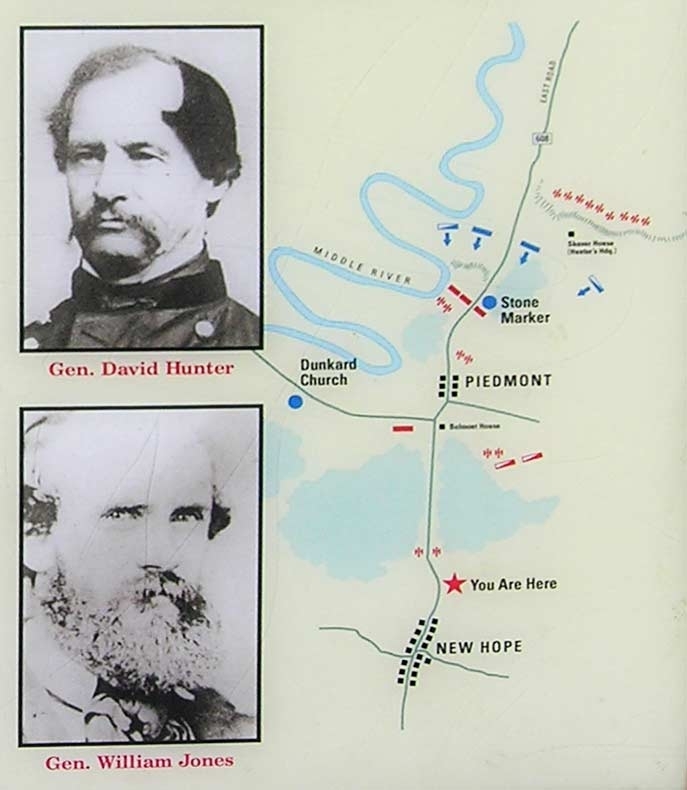 Description: After replacing Sigel in command of Union forces in the Shenandoah Valley, Maj. Gen. David “Black Dave” Hunter renewed the Union offensive. 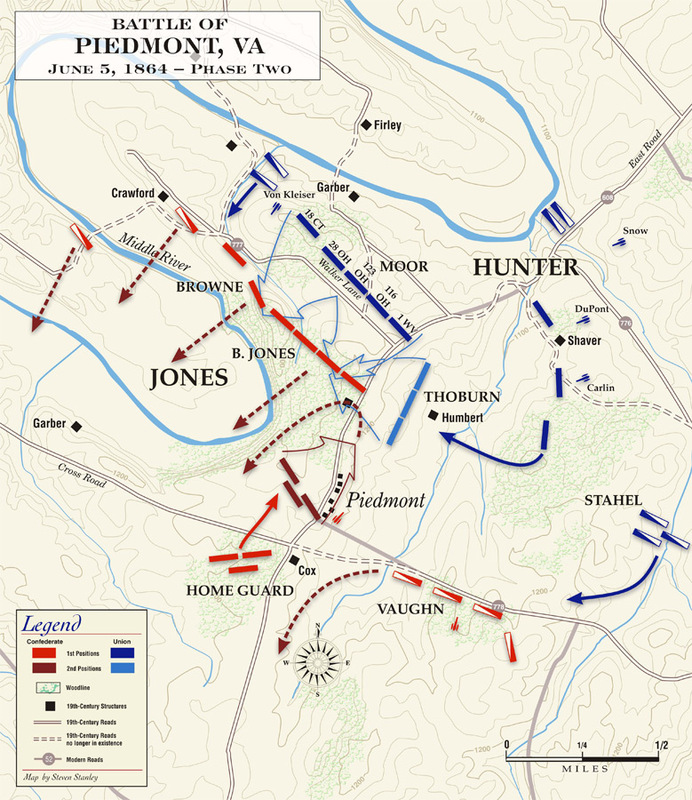 On June 5, Hunter engaged the Confederate army under “Grumble” Jones north of Piedmont. 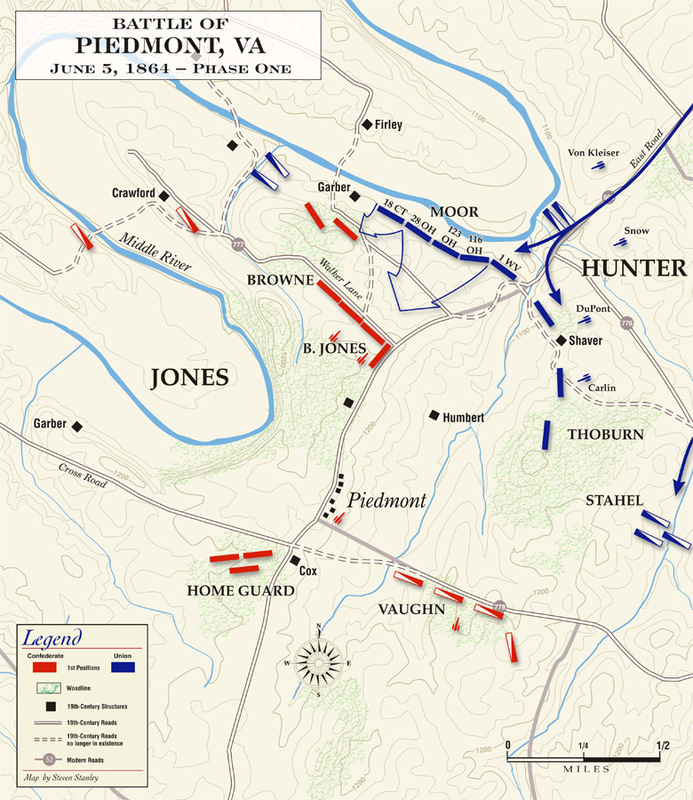 After severe fighting, a flanking movement made by Thoburn’s brigade turned Jones’s right flank. While trying to stem the retreat of his soldiers, Brig. 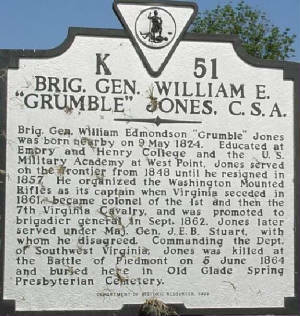 Gen. William E. "Grumble" Jones was killed. The retreat became a rout. More than 1,000 Confederates, including 60 officers, were captured. Jones lost three guns. Hunter occupied Staunton on June 6 and, after a pause to await the arrival of Brig. Gen. George Crook’s column, began to advance on Lynchburg, destroying military stores and public property in his wake. During the battle, Commanding General William E. "Grumble" Jones had shouted to Love's fighting infantry, "Brave Carolinians I will bring you help!" He soon returned with the Thirty-sixth and Sixtieth Virginia Regiments, but it was too late. While pressing his horse across the smoked filled battlefield rallying and encouraging the Highlanders and Virginians, Jones was shot in the head and his lifeless body slumped and fell to the ground. (Official Records of the Union and Confederate Armies, Series 1, Volume 37, part 1, page 606; O.R., 37, 1, pp. 94-95; and O.R., 37, 1, pp. 150-151). Background: At the beginning of 1864, Union Maj. Gen. Ulysses S. Grant was promoted to lieutenant general and given command of all Union armies. He chose to make his headquarters with the Army of the Potomac, although Maj. Gen. George G. Meade remained the actual commander of that army. He left Maj. Gen. William Tecumseh Sherman in command of most of the western armies. Grant understood the concept of total war and believed, along with Sherman and President Abraham Lincoln, that only the utter defeat of Confederate forces and their economic base would bring an end to the war. Therefore, scorched earth tactics would be required in some important theaters. He devised a coordinated strategy that would strike at the heart of the Confederacy from multiple directions: Grant, Meade, and Maj. Gen. Benjamin Butler against Robert E. Lee's Army of Northern Virginia near Richmond; Maj. Gen. Franz Sigel to invade the Shenandoah Valley and destroy Lee's supply lines; Sherman to invade Georgia and capture Atlanta; Maj. Gen. Nathaniel Banks to capture Mobile, Alabama. 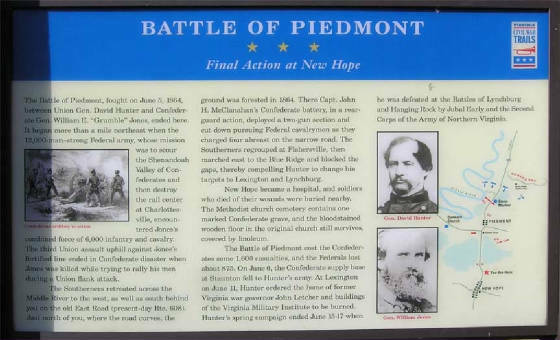 The Battle of Piedmont was one of many battles fought during the Lynchburg Campaign. The Lynchburg Campaign, also known as Hunter's Lynchburg Campaign, was part of the Shenandoah Valley Campaigns of 1864 and was the first of three principal campaigns fought throughout the valley region. Lynchburg Campaign [May-June 1864] consisted of the following battles: New Market – Piedmont – Lynchburg. Battle: After spending a rainy night encamped on the southern outskirts of Port Republic, Hunter's army marched southward on the Staunton Road toward Mount Meridian through the morning mist. Maj. Gen. Julius Stahel's cavalry led the advance, driving back Imboden's outposts. 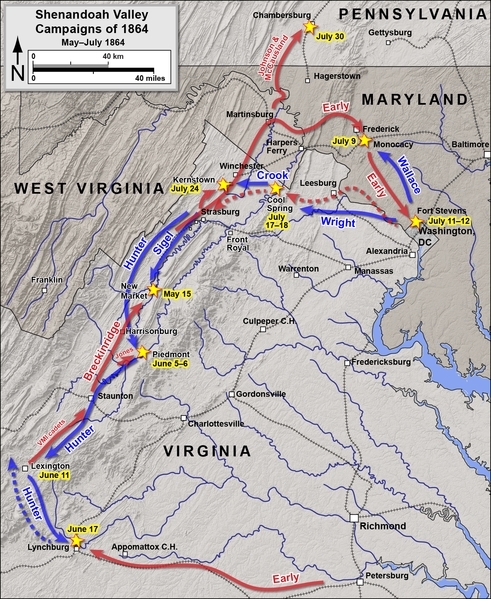 When Stahel's advance regiment reached Mount Meridian, Imboden successfully counterattacked with the 18th Virginia Cavalry. Stahel fed reinforcements into the fight and quickly overwhelmed the Virginians. Imboden barely escaped capture and only the timely charge from balance of his brigade, which included local reserves, saved the 18th Virginia from disaster. The Confederates then fell back slowly toward the village of Piedmont. 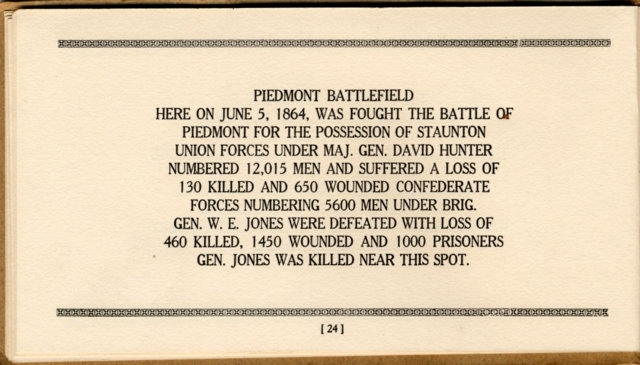 Imboden expected to join forces with General Jones at Mowry's Hill but was surprised to find him at Piedmont. Jones and Imboden debated the situation, but in the end Jones rank won the argument. Jones advanced a battalion of dismounted cavalry, convalescents and detailed men several hundred yards in front of his left wing, backed by a section of horse artillery, and Stahel's advance was stopped. Jones deployed his two brigades of infantry (his left wing) along the edge of a woodlot that ran from the Staunton (or East) Road to the high bluffs of the Middle River that anchored his left flank. He ordered Imboden to guard his extreme right flank with the cavalry. On Imboden's immediate left, Brig. Gen. John C. Vaughn's brigade of dismounted Tennessee and Georgia horsemen went into position. Vaughn's left flank rested six hundred yards to the rear of Jones' right wing, creating a gap in the center of his line. There he positioned two batteries, including Captain Marquis's reserve artillery manned by 17-18 year-olds of Augusta County. Hunter's Chief of Staff, Colonel David Hunter Strother, described the battlefield: "The enemy's position was strong and well chosen. It was on a conclave of wooded hills commanding an open valley between and open, gentle slopes in front. On our right in advance of the village of Piedmont was a line of log and rail defenses very advantageously located in the edge of a forest and just behind the rise of a smooth, open hill so that troops moving over this hill could be mowed down by musketry from the works at short range and to prevent artillery from being used against them. The left flank of this palisade rested on a steep and impracticable bluff sixty feet high and washed at its base by the Shenandoah [Middle River]." At noon, Hunter's infantry under the command of Brig. Gen. Jeremiah C. Sullivan advanced. Colonel Augustus Moor's brigade drove in Jones' advance line on the west side of the Staunton (East) Road, halting along the edge of a wooded lot opposite the one Jones' Confederates were stationed in. Sullivan ordered an advance but Jones well protected infantry repulsed the effort. On the east side of the road, Colonel Joseph Thoburn's brigade advanced through a wooded ravine toward Imboden's position under a heavy artillery fire. Thoburn withdrew to support the Union artillery when he saw Moor's repulse. At this point, Captain Henry DuPont, the Union artillery commander, systematically silenced most of the Confederate guns. Only a few guns with Imboden on the extreme Confederate right remained active. At this point, Jones concluded to withdraw his left wing so that it was online with Vaughn and Imboden, but events soon changed his mind. Sullivan reinforced Moor with two regiments and ordered another attack but was again repulsed. This time the Confederates counterattacked but a stand by the 28th Ohio and some dismounted horsemen armed with Spencer repeating carbines backed by a section of artillery forced the Southerners to fall back to their breastworks. At this point, an emboldened Jones rearranged his forces to launch a concerted attack against Moor's battered brigade. Jones ordered Vaughn to advance the greater part of his brigade to the left wing. The 60th Virginia Infantry moved from its position in the edge of the woods covering the large gap in the center of his battle line. The Virginians ended up in a second line of battle behind the main Confederate line, leaving the gap completely undefended. Jones' concentration of troops against Moor's brigade did not go unnoticed. The Federals spotted the gap on the right flank of Jones' left wing, and Hunter ordered Thoburn's brigade to attack the vulnerable Confederate position. Thoburn quickly advanced to within a few yards of the Confederate left before his men were spotted and shattered the Southern flank. At the same time, Moor's brigade joined the assault against the Confederate front. Jones attempted to retrieve the situation bringing up the Valley Reserves who slowed Thoburn's advance but were unable to throw it back. Jones dashed up to a small group of rallying Confederates and then charged toward the oncoming Union infantry. A Union bullet struck him in the head, killing Jones instantly. The Union forces drove the Confederates toward the bluffs of the Middle River severing the Confederate army in two halves. At the bluffs, the converging forces of Thoburn's and Moor's brigade, backed by some of Stahel's Cavalry captured nearly 1,000 unwounded Confederates. Section of Captain John McClanahan's Virginia horse artillery slowed the Union drive southward as it stood its ground near the village of Piedmont and barely evaded capture. On the Staunton (East) Road, the 1st New York Veteran Cavalry launched a vigorous pursuit of the beaten Confederates. However, another section of McClanahan's battery and elements of Vaughn's brigade not sent to the left hastily deployed along the road between the villages of Piedmont and New Hope. When the New Yorkers chased up the road after the fleeing Southerners, this Confederate rear guard opened fire devastating the Union cavalry and dampening their enthusiasm for any further pursuit. Although at least 1,500 Confederates had been lost, the rear guard action at New Hope allowed the remnants of the army to escape further damage. Vaughn learned that he was now the senior officer as a result of Jones' death, but he was unfamiliar with the Shenandoah Valley and simply adopted Imboden's recommendations. Hunter's army rounded up the prisoners and tended to the wounded at Piedmont, where the Army of the Shenandoah camped for the night, having lost nearly 900 men killed and wounded. The next day, it became the first Union army to enter Staunton, Virginia during the Civil War. Recommended Reading: The Shenandoah Valley Campaign of 1864 (McFarland & Company). Description: A significant part of the Civil War was fought in the Shenandoah Valley of Virginia, especially in 1864. Books and articles have been written about the fighting that took place there, but they generally cover only a small period of time and focus on a particular battle or campaign. Continued below. The writing here is crisp; refreshingly, our chronicler pays sharp attention to the effects of the campaign on civilians as the Union army penetrated beyond its supply lines and came to live off the countryside in one of the Confederacy’s richest agricultural regions, bringing home the harsh realities of war to civilians. The campaign swung back and forth, with Northern victories at Cloyd's Mountain and New River Bridge and Confederate routs at New Market, followed by a Union failure to seize Lynchburg. Though the campaign proved costly to the South, overall the Unions hope to capture the Shenandoah Valley foundered and the Confederates then went on to threaten Washington, D.C. Duncan sensitively employs a wide variety of sources, military and civilian, to add to the coherence of his account. Still, the books scope remains narrow, focusing on a not terribly glamorous period in the wars history; then, too, wed do well to have the volume trimmed by a third. Duncan’s contention that the Unions severity in dealing with civilian populations was directly reciprocated when the Confederates took Chambersburg, Penn., creating a chain of vengeance that culminated when Sherman marched through the South, is insightfully argued, offering a fresh analysis to the historical debate. Casual readers of the Civil War genre (and many die-hard buffs, as well) may want to leave this superbly researched yet ultimately too specialized study for the historians to ponder. Includes 20 photographs. In addition to a narrative of the campaign (featuring dozens of characters, including General George Custer and future president Rutherford B. Hayes), this book is a study of command. Both Sheridan and Early were capable military leaders, though each had flaws. Sheridan tended to make mistakes before battles, Early during them. Wert considers Early the better general, but admits that few could match the real-time decision-making and leadership skills of Sheridan once the bullets started flying: "When Little Phil rode onto the battlefield, he entered his element." Early was a bold fighter, but lacked the skills necessary to make up for his disadvantage in manpower. At Cedar Creek, the climactic battle of the 1864 Shenandoah campaign, Early "executed a masterful offensive against a numerically superior opponent, only to watch it result in ruin." With more Confederate troops on the scene, history might have been different. Wert relates the facts of what actually happened with his customary clarity and insightful analysis. With Shenandoah 1862, Peter Cozzens dramatically and conclusively corrects this shortcoming, giving equal attention to both Union and Confederate perspectives. Based on a multitude of primary sources, Cozzens's groundbreaking work offers new interpretations of the campaign and the reasons for Jackson's success. Cozzens also demonstrates instances in which the mythology that has come to shroud the campaign has masked errors on Jackson's part. In addition, Shenandoah 1862 provides the first detailed appraisal of Union leadership in the Valley Campaign, with some surprising conclusions. Moving seamlessly between tactical details and analysis of strategic significance, Cozzens presents the first balanced, comprehensive account of a campaign that has long been romanticized but never fully understood. Includes 13 illustrations and 13 maps. About the Author: Peter Cozzens is an independent scholar and Foreign Service officer with the U.S. Department of State. He is author or editor of nine highly acclaimed Civil War books, including The Darkest Days of the War: The Battles of Iuka and Corinth (from the University of North Carolina Press). About the Author: Robert G. Tanner is a graduate of the Virginia Military Institute. Tanner is a native of Southern California, he now lives and practices law in Atlanta, Georgia. He has studied and lectured on the Shenandoah Valley Campaign for more than twenty-five years. He also provides insights into the personalities, careers, and roles in Shenandoah of Confederate General John C. Breckinridge, Union general George Crook, and Union colonel James A. Mulligan, with his “fighting Irish” brigade from Chicago. Finally, Patchan reconsiders the ever-colorful and controversial Early himself, whose importance in the Confederate military pantheon this book at last makes clear. About the Author: Scott C. Patchan, a Civil War battlefield guide and historian, is the author of Forgotten Fury: The Battle of Piedmont, Virginia, and a consultant and contributing writer for Shenandoah, 1862. Sources: National Park Service; Official Records of the Union and Confederate Armies; Memoirs of Lt. Col. William Williams Stringfield; shenandoahatwar.org; Patchan, Scott C., The Battle of Piedmont, Virginia, Sgt. Kirkland's Press, Fredericksburg, 1996; Patchan, Scott C., "The Battle of Piedmont and Hunter's Raid on Staunton," The History Press, Charleston, SC, 2011; Johnson, Robert Underswood & Clarence Clough Buell (eds.). Battles and Leaders of the Civil War Volume 4 (New York: The Century Company), 1884; Lepa, Jack H. The Shenandoah Valley Campaign of 1864 (Jefferson, NC: McFarland & Co.), 2003. ISBN 0-7864-1644-0; Patchan, Scott C. Shenandoah Summer: The 1864 Valley Campaign (Lincoln, NE: University of Nebraska Press), 2007. ISBN 0-8032-3754-5.